Tim Murray, on the happiest day of his life. Luke Peristy and I had a conversation about something that happened over seven years ago. CHET: I don’t want to talk about the Senators’ defense today. LUKE: We’re Sens fans. We have to. It’s our duty. CHET: No, you’re thinking of writing out line combinations until your nose gradually starts bleeding. You look for something to wipe it up but all you have is a Jason Spezza shirsey. Somewhere a dog will not stop barking. That’s being a Sens fan. Let’s talk about a happier moment. Specifically, this video. CHET: This clip starts with Gord Miller saying, “You’ve still gotta figure out Wade Redden.” Tell us something we don’t know, Gord. LUKE: The first thing I notice about this video is that somebody filmed it by pointing their Nokia flip phone at their television and pressing record. CHET: The shaky cellphone quality is the best part. Like it’s being filmed from a drone, hovering above the front line of history as it happens. You can’t worry about copyright law in those situations. At 0:39 the phone starts buzzing and whoever owns it says, “I can’t take this call, I’m bootlegging TSN.” I respect that. LUKE: The second thing I notice is Eugene Melnyk approaching the stage with Daniel Alfredsson as thousands of Sens fans cheer. Is this what Ottawa winning the Stanley Cup in 2007 would have looked like? CHET: They’re cheering for Melnyk, right? The 45-second ovation Melnyk gets here probably hasn’t been matched, cumulatively, in the seven years since this happened. LUKE: I’d like to think that we as a fan base have reached a kind of uneasy peace with the Euge at this point. He seems genuinely happy to be alive and to be able to spend time with his daughters. Could Eugene Melnyk’s realization that there are more important things in life than hockey set a good example for the rest of us? I’ll get back to you on that just as soon as I’m finished typing out these line combinations. Shaved-head Daniel Alfredsson was a good time, wasn’t it? He looks like Megamind. LUKE: Alfie’s hairstyle is clearly foreshadowing the LEGENDARY moment when he would win the Mark Messier Leadership Award For Being Most Like Mark Messier a few years later. CHET: Shaved heads were the style at the time. It wasn’t until Mats Sundin retired that the Swedish guys felt safe growing their hair back. Before that he was like, “if I’m going bald, so are you, spädbarn.” And they had to do it. He was the national captain. LUKE: How about Tim Murray in this clip? He’s positively chatty! “We’ve had a great time in Ottawa,” he says, correctly feeling the temperature of the room. In terms of All Time Great Draft Traditions, where does thanking the city that’s hosting the draft rank? I’d say below booing Bettman, but above Philly fans booing whatever disappointment they end up drafting in the 1st round. Is the booing the only reason to attend a draft in person? CHET: This is the most Tim Murray has ever said at a podium. He hasn’t completely turned heel yet. No D&G frames, strong Shawville accent. He says the word “fans” like someone who’s been thrown out of a Legion more than once. LUKE: If you’re ever in Shawville, ask a local to tell you about The Tim Murray Pancake Tuesday Legion Dinner Incident. I promise you won’t be disappointed. Okay, so Daniel Alfredsson announces the pick of Erik Karlsson from Frolunda, and Pierre McGuire immediately launches into a monologue in which he describes Yung Karl as “the Swedish version of Brian Rafalski”. Knowing what we know now, is this a bit like describing Bjork as the Icelandic Yoko Ono? Sure they’re both weirdo avant-garde artists, but only one of them can sell out the big arenas. CHET: The arena isn’t even sold out! They show Alfredsson and then a bunch of empty seats. STRONG troll game. This was when TSN had rights to other teams. But yeah, Swedish Brian Rafalski. Keeps trying to turn Scott Stevens on to Cardigans deep cuts. Stevens will have none of it. Then we see him for the first time – it’s Erik Karlsson. LUKE: Huge shoutout to the Sens’ scouting for this pick. CHET: The silence after this pick is deafening. These people wanted Joe Colborne. LUKE: But look at this kid. He’s 18 going on 10 with hair that looks like he was trying to have a mullet but started to grow it out three weeks too late. CHET: Check out Jos. A. Banksson in a charcoal suit. 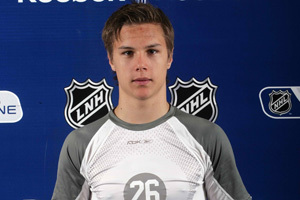 This was the last time Karlsson was seen wearing plain neutrals. It’s not that success has changed him; he’s wishing desperately he was in a crocodile-print three-piece here, but doesn’t want a primadonna rep on day one. He knows the Sun is watching and as far as they’re concerned Sweden is practically Russia. LUKE: Hey, you can go in on EK’s decidedly un-zesty wardrobe choices if you want, but if there’s one thing last year’s Ottawa Senators taught me, it’s that it’s not how you start, it’s how you finish. I don’t see the point of starting the day in a purple velour dinner jacket made from one of Hugh Hefner’s couches when you’re going to be spending the evening in your brand new Ottawa Senators jersey. LUKE: The Sens took one look at this undersized boy and said, “On this rock we shall build our defense.” Or at least they said, “This kid will be the next Brian Rafalski. Meh, we’ll take it.” Also let’s give it up for this head shot of EK. CHET: That headshot could literally be anyone. It looks like bad CGI. It looks like you took one of the generic heads from NHL ’08 Create-a-Player mode and then put a blurry picture of it on the side of a milk carton. Have you seen this completely featureless boy? He was last seen being an expressionless canvas onto which you can project your wildest expectations. If found please call his parents, Henrik and Ilsa Rafalskiberg. LUKE: Karlsson was the first part of a rebuild we didn’t even know was happening yet. Another way he was ahead of his time. CHET: Reminder that the Sens traded up from 18 to 15 to get this pick. The Predators took goalie Chet Pickard at 18, also referred to in the context of this article as “the second worst Chet ever”. But the Sens have the Karlsson jersey ready, so you know he was their guy all along. It’s neat how with the exception of Tim Murray, who got a promotion, the Senators front office is still pretty much all the guys on this stage. One first-round playoff win since, by the way. What’s crazy is how casual Karlsson is with Alfredsson, like, “Oh yeah, Frolunda, me too. Those showers in the locker room though, am I right?” Just not grasping the symbolism at all, even after Alfredsson hands him the hat while saying, “So also, you live with me.” Then Karlsson sidles up to Melnyk and does this huge, OVER THE TOP, arm out move, slapping him on the back. That is like a ’91 Jordan dunk, that move. That is a man who has hugged a billionaire before. LUKE: Hugging a billionaire is one thing, but then he goes for the arm around on Tim Freaking Murray?! This guy’s confidence is out of control. He just got drafted, doesn’t even have a contract yet, but he’s still putting the moves on his bosses like they’re a couple of girls he invited over for Netflix and Sauna. Let’s see Kimmo Timonen do THAT! LUKE: For my money, the best scouting report Pierre could have given was, “Erik Karlsson won a car from his dad in a game of poker at the age of 12.” You don’t need to know how good he is at moving the puck once you find out he was fleecing his old man at cards before he was even a teenager. CHET: Then James Duthie asks, “Can you play in the NHL?” Setting up Karlsson’s first “obviously” on a goddamned tee. But he’s only 18 so it’s understandable if he can’t pick up every play right away. Cute kid, though. His skull is, what, 75% bigger now? LUKE: It’s incredibly weird listening to this guy talk about putting on some muscle when seven years later, his own coach says he doesn’t even need to go to the gym, but does it anyway because he’s a good leader and also happens to have arms as thick as his neck. Then he’s asked which player he’s most like and his answer is Niklas Kronwall, who is the hardest Swede outside of a maximum security prison. James Duthie does a great job of dealing with Karlsson’s utter lack of chill, saying, “That’s a darn good answer,” instead of saying what I would say, which is “LOL, K, Niklas Kronwall could eat you, tiny man.” I can’t get over this kid. Then Bryan Murray shows up to clarify that a) future senior hockey advisor Daniel Alfredsson had nothing to do with this pick, and b) in today’s NHL, you need skill on the blue line. Both GREAT looks for Bryan in 2015. LUKE: Look at that wise hockey executive espousing the importance of skill on the blue line. Whatever happened to him? I wish he could run my hockey team. CHET: “We don’t need a big guy,” Murray says. “We need somebody good.” This is like an alternate universe where Jared Cowen was never born. LUKE: You want to talk alternate universe? James Duthie just said, “Darren Dreger just reported that you extended Chris Kelly for four years.” The 2008 Ottawa Senators: crafting for skill and signing the Corsi Gawds long term. What happened to this team? How did they ever lose? Wait, Duthie just asked, “Will Jason Spezza be a member of the Ottawa Senators on July 1st?” That’s totally from this universe. I recognize that. CHET: Bryan Murray with one of the all-time #actuallys here – “his no-trade doesn’t kick in until next year, James.” In other words, we’ll trade him whenever we damn well please – this year, 2014… we’re really going to explore the space with Jason Spezza’s job security. Maybe we’ll make him the captain and THEN trade him, just to really screw with the guy. We have Erik Karlsson! We can do anything we want now. That was incredibly entertaining. Thank you!